Whether it’s dog handling or pet photography, professionals certainly make it look easier than it is. Capturing decent photos of my big dogs is about as easy for me as sewing a cargo bed liner some days. Not easy. If I succumb to the typical victim mentality, I would tell you it is because my phone is too slow, my camera is never on the right setting, my dogs won’t sit still, shut their mouths or stop drooling. While all of these are true, they are not the reason for my less than awesome pet photography. While it would be nice for every picture of Junior and Sulley to be perfect, my standards are much lower and commensurate with my skill set: clear images with a big dog (and minimal slobber…although that is asking a lot some days). With this in mind, I reached out to three of my favorite professional pet photographers to get some advice. 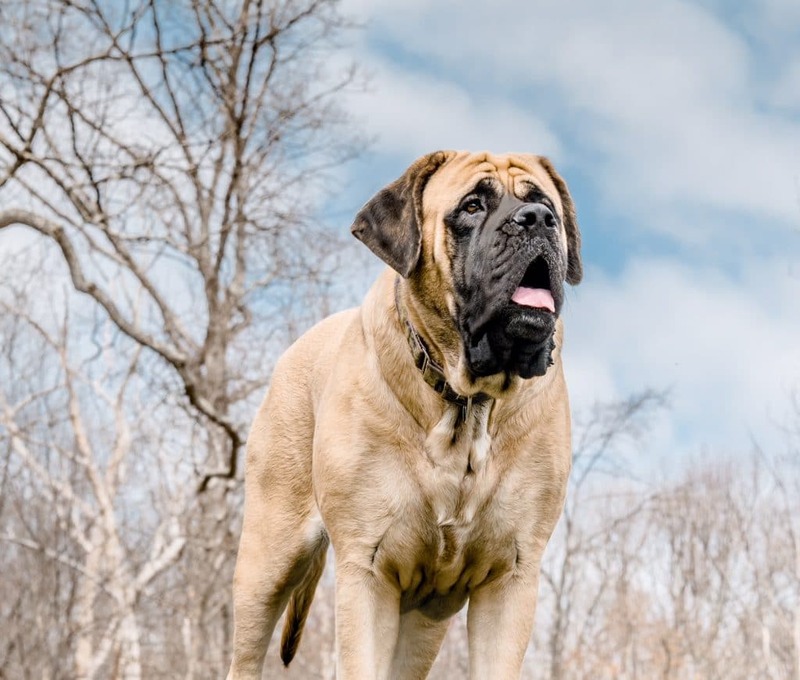 My objective was not to seek “How to” information on capturing perfect photos, but to gather simple, actionable tips for people of all skill levels to capture better quality photos of our big dogs. Q: If dog owners would just do THIS, the quality of their dog’s images would improve substantially! What would you say that one thing is? Why? How has it helped you? Claudia: Patience. To better capture their personalities you need to be patient with them. Wait for the right moment. Do not rush them or force them to pose. Instead of attempting a posed shot, go along with their playfulness and make that the main feature of your image. Also, catching them when they’re not aware you are watching can allow you to capture their natural behavior without interrupting their “business”. Patience will pay off eventually. Q: What piece of pet photography equipment could you not live without? Why? Claudia: Well, besides my Nikon D750, shooting dogs (or any other pets) outdoors is a NIKKOR 70-200mm zoom lens. This lens gives me the reach I need plus it’s fast and produces quality images. At 200mm, the bokeh is amazingly beautiful. For indoors, I like the Nikon Sigma 50mm. It focuses very fast, is very accurate, and the bokeh is creamy and very sharp. I truly can’t find anything I don’t like about this lens. Q: What is the biggest mistake you see dog owners make when photographing their dogs? Claudia: Photographing them while standing. While sometimes a different angle is welcome, getting down at their level and aiming for their eyes allows you to, for a moment, enter their world to learn what it’s like to be a dog. The bonus to this perspective is that they tend to look at you funny too. Don’t be afraid to get down and dirty. Claudia lives near Seattle, Washington with her husband, Paul, her two mastiffs, Boromir and Pippin, and their cat, Boomerang. She can be reached on her website ClaudiaPetPhotography.com. Holly: The biggest thing pet parents could do to improve the quality of their images would be to find the natural light. When outside, turn your dog’s face toward the sun/light source. When indoors, turn off the house lights and open your blinds. Get your dog close to the window and illuminate their face with the window light. When you shoot in “auto” mode (such as you would with a smartphone for example) you have to do all you can to help your camera make the smartest decisions that will result in the best images. I shoot in manual mode with my DSLR camera, so I can tell the camera what I want it to do so I don’t necessarily have to face a dog into the light for example. I can shoot with the light behind them and tell my camera to expose for the dog’s face, not the bright sky. However, a camera shooting in auto is likely to darken the dog’s face and make the sky nice and pretty which effectively turns the subject into a big, dark blob. So when shooting on auto, turn your dog’s face into the light for the best results! *For more great pet photography tips for those using only a smartphone, check out Holly’s article, How to Take Incredible Photos of your Dog with your Smartphone. Holly: The piece of photography equipment I definitely could not live without would be my Canon EOS-1DX Mark II camera body and my lenses obviously. More specifically, my Canon 70-200mm lens is a must have for a dog photographer! In terms of non-photography gear, I couldn’t live without my noisemaker necklace. It’s great for getting a dog’s attention! Holly: One of the biggest mistakes that pet parents make when photographing their dogs is always taking their photos from a standing position, looking down on their dogs. You can get a much more engaging photo if you get down to the dog’s level, and take the photos from there. 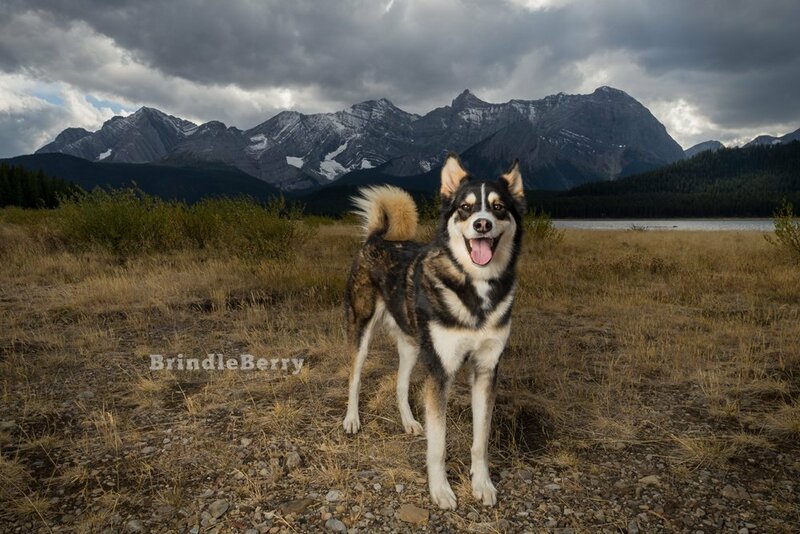 Holly lives in Calgary, AB Canada with her husband Ron, and her three dogs: Grizz, Kingsley and Pebbles. She can be found at BrindleberryPetPhoto.com, on Facebook, Instagram, Twitter and by email at Holly@BrindleberryPetPhoto.com. 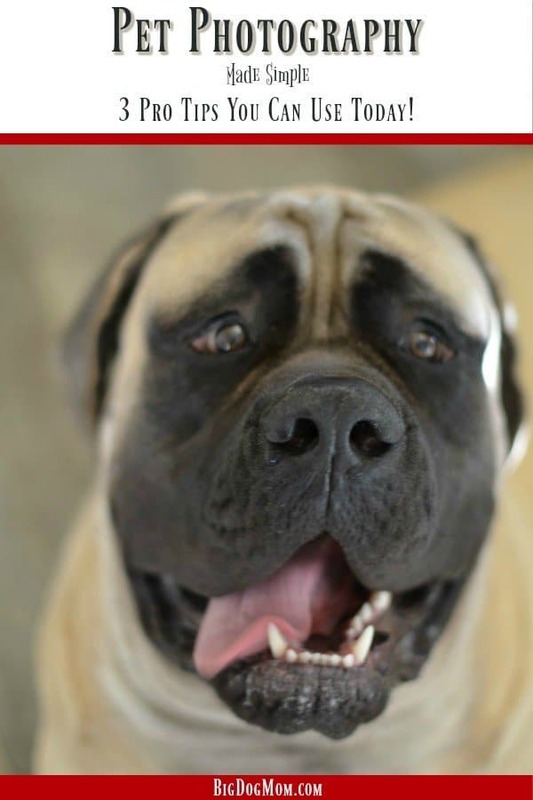 When she isn’t busy with pet photography, Holly is the author of a fantastic blog, Brindleberry Acres, filled with great tips and tools for savvy dog owners who want to better care for their dogs. Experience less noise in higher ISO images via a new 20.2 Megapixel full-frame CMOS sensor, with an ISO range of 100 51200; expansion to ISO 409600. Inner focusing system with USM focus adjustment. Closest focusing distance: 1.2m / 3.9 ft.
Maria: Stop photographing their dogs from above. You’re going to get the best shots when photographing your dogs when you do so at their level or shooting up. You get a better perspective and it’s simply a more flattering angle. I think that is one of the things that help me capture pictures that are truer to the animals I photograph. Maria: In addition to my Nikon D7100 (soon to be Nikon 810 or Nikon 850), my favorite piece of equipment is my NIKKOR 600mm. It allows me to shoot truly candid pictures. Maria: Not giving any thought to the background. The background is part of the picture. It can make a good picture great or have the opposite affect – and make a good picture fail. In addition to her amazing pet photography skills, Maria has been my go to source for all things nosework and dog sports. She lives in Pennsylvania with her husband Bill, their two Mastiffs Regan and Amity, and a variety of other creatures great and small. Maria can be reached by email at MariaRuoto@me.com and on Facebook. If I asked YOU the same three questions as I posed to these professional photographers, what would you say? What, if any, pet photography tips would you add to the list above? I would love to hear from you in the comments below. And if you happen to have some dog parent friends who could use some of the professional tips from Claudia, Holly and Maria, please share this with them using the buttons below. It is at this point that I suppose I should offer some of my own tips for photographing big dogs, considering I’m Big Dog Mom and all (again… NOT to be confused with Big Mom). Well, here’s my advice for all you big dog owners out there; grab a few drool cloths, a squeaker toy and head outside. Remember our standard isn’t picture perfect, it is a clear image with minimal drool. Thank you, this is very helpful 🙂 I followed you. Yes, I’m always kneeling or on the ground for shots. Or we just put Mr. N up high. That works too. He knows a “look at me” cue which is helpful. Love it! “Look at me” would come in very handy here! These are awesome tips! I think that the background makes a huge difference, especially if you don’t have a shallow depth of field. I hope you get some great photos of your dogs with drool too. You want to document the everyday moments too. Thank you so much, Beth! Absolutely! Excellent, Ruth! So happy these tips were helpful! Great tips! I had a photography studio for many years so understand the difficulties people have in taking pics of their pets. Capturing the right shot is the best feeling in the world — to me the low to the ground shots are the best with pets since you are capturing their world at their level…..and lighting is EVERYTHING!!!!!!! I do not care how popular cell phone pictures are — there will never be anything like a real film picture! Thank you so much, Jill! Unfortunately, our phones are often the most convenient option when just the right moment arises. But you’re right, there’s nothing like the quality of a “real” camera! Haha! My husband does the same thing. I’m constantly telling him and my kids to kneel down to take pictures of the dogs. Funny it’s not something that occurs to most people, but it’s the one thing that can make such a big difference. Thank you, Debbie! I love getting down and photography pets at their level…it also keeps me limber and I’ve gotten a few unexpected kisses and push-overs as thought the dogs thought I was a new playmate. These are all great tips with patience at the top. Thanks for sharing. Great photo tips that I will have to try to follow! I am totally bookmarking this! I do a few of the tips already such as getting down at my dogs level! Most however are totally new ideas to me! I also love the tips on the best cameras! I need a good camera so I will check this out again soon. Wonderful, Joely! Thank you! These professionals swear by the equipment they use so I tend to believe they are right when they say these cameras and lenses are the best. These are great points! We have found that some of our lower shots have turned out the best, as you mentioned above. We find the dogs are more engaged when everyone is having fun! That’s a great point, Katie. I do think our own attitude and emotion will impact the dog’s behavior and, in the end, affect the quality of the pictures. Best to keep it fun and light-hearted and let the dogs be dogs. Thanks for the tips! I too often take photos from above. I need to get down on the ground. I also agree that natural lighting is best, but hard to do when it is so cold outside! I’d just like to add that you should, when possible, enlist somebody to assist you and keep your energetic pet interested and focused. And always remember to have plenty of tasty treats at hand. Absolutely! Having an assistant on hand to help would definitely help!